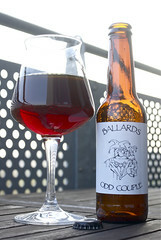 Ballards Odd Couple (8.9%, Harvest Ale) – One of my Christmas present beers, picked up by my Dad from The Beer Essentials in Horsham as part of a bag of interesting looking bottles. I’ve keeping this one as I’ve rather liked previous things I’ve got from Ballards and a sunny evening on the day the clocks go forward felt like a good time to open it. It poured a deep red with no head and minimal fizz, looking more like a young tawny port than a beer, deep reddy brown and starting to lose its translucency. On the nose it was big and savoury, and my notes say simply ‘Cherries and Bovril’. To taste it started with a big sour fruit and meandered through green hops, more meaty Bovril (definitely Bovril rather than Marmite) and finished with a bit of fresh juicy cherry with a hint of sour unripeness. Marks & Spencer Wiltshire Rum Beer (5%, Best Bitter with added Caribbean Rum) – I got this one as a swap for a bottle of Monsieur Rock and I think that my swapping buddy got the better deal. This is a blend of Wadworth 6X and rum, upping the normal 4.3% strength of the beer to 5% and adding a bit of rum related flavour – it’s regular bottled 6x, a dry medium bodied best bitter, with a hint of extra sweetness in the middle and a bit of raisin and fruit cake on the finish. Not my favourite and not as sweet as I was hoping – half of this went into the beef stew I’ve cooking and I added a couple of extra shakes of Lea & Perrins after tasting the beer. To add a bit of spice to the rest of the glass of beer I poured in a shot of Gosling’s Black Seal Rum, which further filled out the dry gap in the middle of the taste, adding a chunk of raisin, accentuated the maltiness of the beer and lengthened the finish to be a lingering mix of malt and sweet rum. 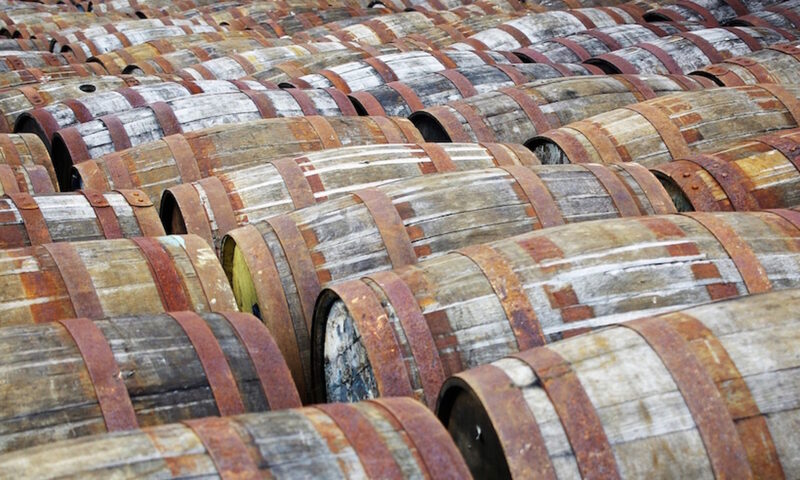 There’s definitely a place for ‘grogging’ rum with beer, but you need a bit more than Wadworth added to make it special, in my opinion. However, I’ve heard that the laws about mixing spirits and beer are on the strict side, so I suspect that might have had something to do with Wadworth’s reticence as well. Master of Malt Highland Park 13 year old Single Cask (57%, single cask Highland single malt Scotch whisky) – One of a pair of Drinks by the Dram that I got as an unexpected present from the folk at MoM at Christmas, this has been sitting on my tasting shelf amongst the last batch of drams that I bought from them and got forgotten until I did a bit of tidying this afternoon. This one is a bit on the light side for a 13 year old, looking a bit like a medium white wine, but has a much more oomph in the nose – peat, fruit cake, lightly roasted meat, butter and a bit of straw. To taste it’s sweet and sour, starting with a burst of sweet grapes and hard candy but quickly turning to sour grapes, tannins and caramel, with a finish of mulchy floral peat and sweet wood. At 57% it’s a bit prickly and a couple of drops of water killed the burn and revealed candied lemons and floor polish in amongst the initial sweetness, and lengthened the finish. Master of Malt Caol Ila 30 year old Single Cask (57.4%, single cask Islay single malt Scotch whisky) – the second of the Christmas drams and one that’s kept its strength over the years of maturation (I suspect they filled the cask a bit stronger than usual), also picking up a bit more colour than the Highland Park. On the nose it had lightly muddy peat smoke underneath creamy vanilla, bananas and nail polish. To taste it was big and fruity to start, with green apples and light raisin sweetness before rolling through a very strange middle of menthol, sour liquorice root, liquorice pastilles and “tannic hot tarmac” (the sensation and flavour you get as you walk past some workmen laying a new road and breathe in), and finishing with stony peat coupled with a touch of barely ripe grape. A couple of drops of water helped this one come together a bit, with the sweetness mixing with the menthol and liquorice to give a big old-school sweet shop middle, but keeping the long peaty mineral finish. I’m really not sure about this one (although I suspect I like it a lot), but it’s rather interesting. This post has been brought to you by occasional breaks to go and chop, fry and stir bits of a beef stew, and Nerf Herder’s self-titled and ‘How to Meet Girls’ albums. I never saw them headline a gig, but they are amongst the finest support band I’ve ever seen. Here’s their tribute to Van Halen. 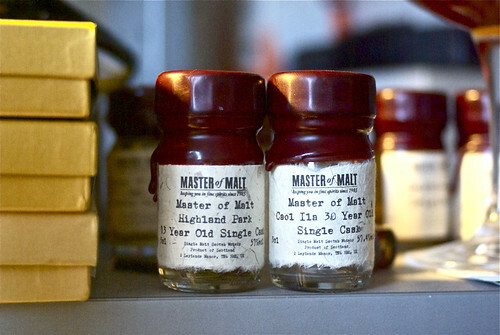 Many thanks to the lovely folk at Master of Malt for pinging me the pair of drams – much appreciated.